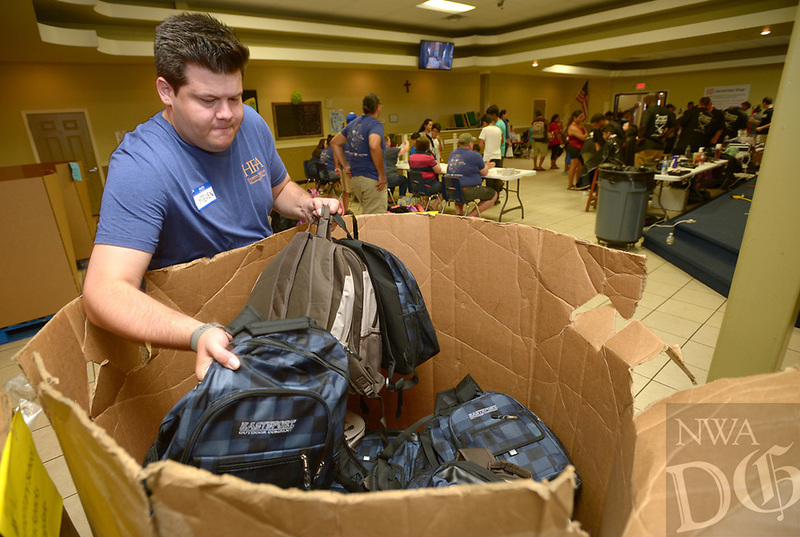 Steven Baker, a volunteer associated with HFA, an architecture and engineering firm in Bentonville, helps Saturday, Aug. 4, 2018, to distribute backpacks to children during the 19th annual BackPacks for Kids Day at Samaritan Community Center in Springdale. The organization distributed 3,300 backpacks full of school supplies to children in grades k-12. Parents received a ticket through the Samaritan Community Center Market Food pantry this summer. The event, which happened at both the Springdale and Rogers locations, also featured free haircuts, food and games.